South Bend Region Economic Development - Why Not Us? Drive through Ignition Park near Downtown South Bend, and you'll see a cluster of buildings including TRANSPO, Catalyst One and Catalyst Two. This campus-like tech hub, a state-certified technology park, houses 150 technology employees with Ph.D.s and master's degrees, keeping quality talent here and bringing in top talent from around the world. 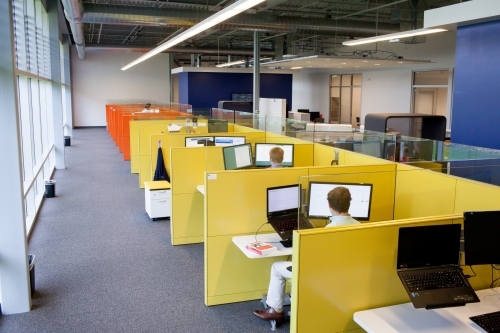 By making the decision in 2011 to relocate from Innovation Park at Notre Dame to Ignition Park by building a new 50,000-square-foot data center, Data Realty became the spark for the technology work that is currently underway at Catalyst One, which also houses the data science company Aunalytics and managed I.T. provider MicroIntegration. The Catalyst Two building houses the new $36 million Notre Dame Turbomachinery Lab, a high-powered research laboratory to analyze and advance the technology of gas turbine engines used for jet aircraft and power generation. Data Realty, a data management company, combines the traditional services of a data center with a managed infrastructure designed for data analytics. Their technology expertise meets the complex security and computational needs of large global organizations, and is scalable to serve the analytics needs of mid-market organizations as well. Collaborating with Aunalytics, clients are able to receive Ph.D.-level data science and analytics expertise to answer their most pressing business questions. With a current niche in consumer brands and health care, their mission is to harness the power of data and use it to fuel the economic engine of growing companies, communities and people. Serving as the company’s president and COO is Rich Carlton, a native of the area who, for the past two years, also served as chairman of the South Bend Regional Chamber board. chamber magazine spoke to him on a number of topics, including data analytics, the South Bend Regional Chamber and area economic climate. You recently mentioned that if South Bend were a stock, you’d buy it. Why? I think our best days are ahead of us. The reason for this is that more than ever before we’re seeing tremendous cooperation between the community and universities here—in particular the investment the University of Notre Dame is making in economic development. It’s a global brand that we can build off of. ND Turbomachinery could have located on campus, and it would have had very little impact on the community. By building it in Ignition Park, it became the right impetus for other growth and entrepreneurial activity that is occurring here. There appears to be an attitudinal shift in the area as well. What’s behind this? We’ve had some wins. Over the past few years with the business growth that we’ve experienced to winning Regional Cities to the new housing downtown, you can feel the momentum. I think we are seeing the fruits of our labor that began eight to 10 years ago start happening. If you don’t see good things happening in our community—if you haven’t seen a massive upswing in the overall quality of life in the region, and where we are heading, then you’re not trying very hard. Things are thriving; there’s energy and vibrancy. Talk about the work being done at the campus where Data Realty is headquartered. The things that are happening in this Ignition Park corridor—the things we are doing with data and analytics—are the same as what is being done in Silicon Valley. We can (and do)compete with anyone in the world because, for the first time, we are capitalizing on the talent and resources that we have here. I can’t imagine that there’s any place in the northern third of the state that has a higher concentration of advanced degrees in technology in one place than what Ignition Park has right now. The data scientists and software engineers at Aunalytics stand up against anyone in the country. Our infrastructure and engineering team at Data Realty is using the same (and often better) technology that Fortune 50 companies are using, and bringing it to the Midwest, and talent that used to leave here is staying or coming back. What is the selling point to attract technologists, analysts, engineers and other top technology talent here? What we are seeing with our employees is that you have a great quality of life here. The drawback that we previously had in our community was that it was a hard place to be in your 20s and be single. We’re now seeing the positive impact of a lot of individuals and groups like the Chamber’s Young Professionals Network. There’s more of a vibrant feel in downtown South Bend, and the investments that have been made there in our urban core give our employees a very different impression than what people had maybe 10 years ago. The majority of our employees are in their 20s and early 30s, and they find our community thriving, eclectic and creative. They've found it to have affordable housing, while still being close to larger cities. But the biggest thing that is keeping them here is that the work they are involved in is challenging and exciting and making an impact. I’m really excited to see what happens in the next year when all of the downtown South Bend housing comes together. That will add even more excitement for millennials who are champing at the bit to move downtown. It should drive more restaurants, pubs and continue to build that vibrancy in the community. We’re already seeing that critical mass here at Ignition Park, where at Catalyst One, there are more and more technologists. While it’s a cool place to be, we also tried to design the office space to be more of a technology-based community. What you see here, you don’t see at other areas of the community. It’s why people from Texas, California, Illinois and other states are choosing to stay here. What’s next for the Chamber and community to focus on? I believe the Chamber and the community need to think really big. Using a sports metaphor, perhaps we were like the Chicago Cubs. We had won before, but we hadn’t won big for a long time. Now, we’ve shown that maybe we can win the division or make the playoffs. But it’s time to quit talking about simply winning the division or making the playoffs–it’s time to talk about being the best and winning the World Series! We have the same resources at our disposal like a Raleigh-Durham, Stanford or Boston. Why not us? I think the Chamber should continue to lead and enable the type of activity where entrepreneurs thrive, drive relationships among community members—government, education or independent business—to keep us working together on the same page and thinking really big. Learn more about Data Realty at data-realty.com and Aunalytics at aunalytics.com.